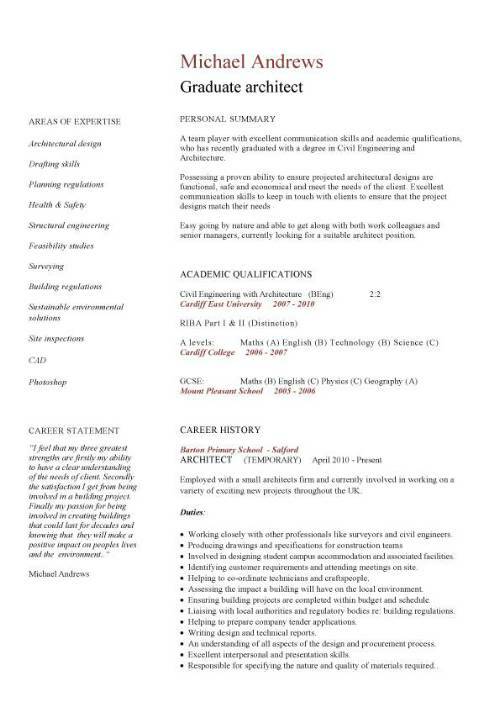 On this page you will find a link to a professionally written graduate architect CV template and also get tips on what points to focus on in your CV. Experience of AutoCAD and other specialist software. Client facing with good inter-personnel skills. Demonstrate your creative and technical ability. Able to work on a number of projects at once. Able to negotiate with clients. Coordinating architectural work plans and also implementing them. Familiar with methods of procurement, including the bid and evaluation process.